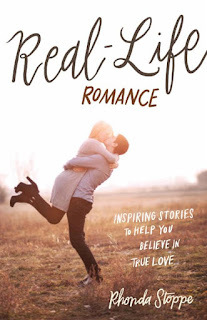 I honestly wasn't sure what to expect from Real-Life Romance by Rhonda Stoppe. I guess I expected all sappy stories I didn't think it would give the grit and truth of marriage. The hard work side of things. This book totally surprised me. Not only are the stories truthful they are relatable. The stories shared are heartwarming and transparent. It is not all kids who met in high school and knew they would get married right then and there, and definitely not all roses. Some of the romances took time to develop. Each of these couples started out with strong faith or found it along the way. I really enjoyed reading this book and getting a glimpse into each romance. While this book shares short stories about each couple it also has a devotional aspect taken from each stories theme. I liked that duplicity of the book. I think this book could really inspire people who are looking for a partner but losing hope. I've talked to many young friends who feel like they might never find love and I always say - in God's Time - but it hard to hear that from an old married lady. This book will inspire hope and they can see real stories from all ages and all situations. I plan on recommending it - often. I don't know why and can only credit The Lord but I decided to give that church another shot, a last final shot. I started attending and getting acquainted with some people. That week was revival services and so the week was full of services. I met my husband that week but I had no idea it would be him. I actually asked him out one of the nights and he turned me down. I had asked him to go trick or treating (which was taboo as no one really celebrated in our denomination - which I didn't know.) The next night he realized I was serious about going out and asked me if I would like to go. He likes to say when he realized I had asked him out he thought he had missed his opportunity. I'd love to hear your Real-Life Romance - Please share in the comments!